There are plenty of summer camp options in Des Moines and choosing among them might be dizzying. But if you have a budding athlete on your hands or one who is trying to improve his or her skills, you might want to consider a sports camp. We’ve rounded up a few for you. In addition to the camps listed below, check out your local YMCA, School District, Youth Sports Program or Parks and Recreation office for programs offered at reasonable prices. And be sure to check out our Summer Camp Guide for more camps in the area. Note: This is a working list, so check back often for new listings. 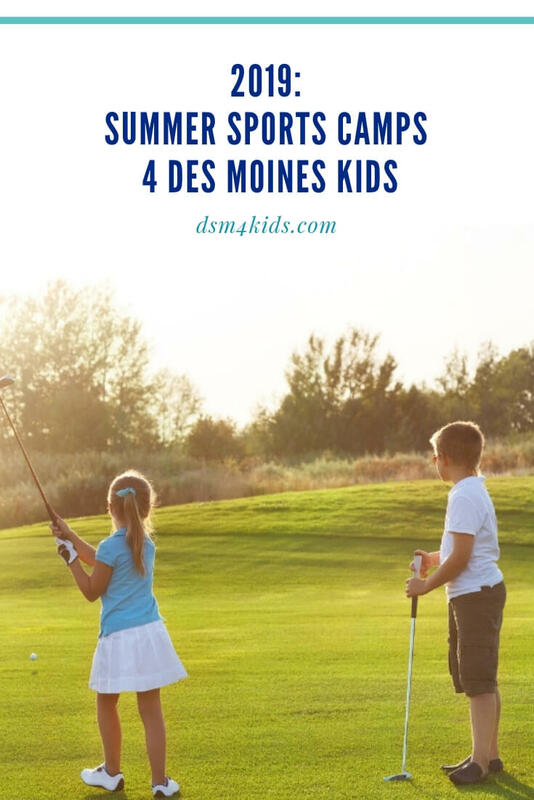 If you know of a sports themed summer camp or clinic that you would like to have included to this guide, please email the listing information to nicole@dsm4kids.com or leave a comment below. Courage League Sports is a non-profit adaptive sports and recreational facility that offers year-round programming. CLS typically offers a number of summer camp and class opportunities for school aged kids with special needs. Central College offers a number of sports related camps and clinics. Instructors will include members of the Central College football coaching staff and outstanding high school coaches from throughout the Midwest. Camps offered include football, soccer, baseball, track and more. Camps kick off in June. Registration info. is available on-line. At Drake summer camps, young athletes not only learn to become better players but also will be challenged with motivational lessons on sportsmanship, leadership and teamwork. They will be hosting camps for football, men’s and women’s soccer, men’s basketball, women’s basketball, volleyball, tennis, and track. Grand View offers a variety of camps and clinics during the summer for young athletes. In the past they’ve offered boys’ and girls’ basketball, football, golf, soccer, volleyball and wrestling camps. New information is posted on their athletics website as it is available. Each year, Iowa State hosts a variety of Summer Sports Camps. You can find information and contacts for the sport you’re interested in by visiting their individual websites. A few that have offered camps in the past include, football, men’s basketball, women’s basketball and volleyball. Join Opportunity on Deck during their Summer Multi-Sport Summer Camp. Kids will learn the fundamentals of ultimate frisbee, lacrosse, karate and volleyball. This FREE camp is open to girls and boys going into 1st through 6th grade in the fall. It is open to all families, but the program is built for students who haven’t had the chance to participate in other summer camps due to cost of participation. Summer camp dates are August 12-16, 2019 and registration will open in March. Simpson College hosts a number of sports camps over the course of the summer. Kids can participate in volleyball, football, soccer, and wrestling camps. You will need to visit each individual site for program information and registration details. Game Ready Sports Training specializes in providing indoor and outdoor team practice space, hitting & pitching indoor leagues and private & small group instruction for baseball and softball. They also provide camps and clinics run by Game Ready coaches. They have two facilities located in the Ankeny/Johnston area and on the South side of Des Moines. Iowa Baseball Camp for the Deaf is a non-profit organization committed to providing baseball experiences for deaf and hard-of-hearing children living in the state of Iowa. They provide an instructive, safe and fun environment for the children to learn fundamental baseball skills in addition with fun activities. This year’s camp will take place at Johnston Little League in Johnston, Iowa. Breakthrough Basketball offers summer basketball camps in Des Moines. These multi-day basketball camps are for boys and girls of all ages and skill levels. Camps being offered in Des Moines include: Ball Handling, Shooting, and Decision Training and Shooting & Ball Handling Camps. Court Time Basketball camps work to develop each player and touch on the intangible qualities that are an important part of being a person of character as well as a good teammate and player. Basketball is a sport that requires these elements to produce winning teams and winning citizens for life. They offer a number of camps for both boys and girls entering third through eighth grades. Basketball Fundamentals related to ball handling, footwork, defense, shooting, and spacing on the floor will be taught by DMC Varsity Boys and Girls Basketball Coaches. Fun games are also played throughout the camp. For boys entering grades 3-8, June 3-6, 2019. For girls entering grades 3-8, June 10-13, 2019. Children ages 7-14 attending the camp will experience football fundamentals taught by the best collegiate and high school coaches in the midwest along with hands on instruction throughout by former NFL, Iowa Hawkeye players, Iowa high school football legends – Tim Dwight and Tavian Banks. Watch the website for 2019 dates. The First Tee of Central Iowa conducts summer instruction sessions in June and July. Golfers are grouped by age and experience level. Golf equipment (starter set of clubs with bag) is provided, if needed, as long as supplies last and “scholarships” are available to help cover program costs. Each lesson covers: life skills, rules and etiquette, full swing, short game and putting. Junior Camps offered at West Grand Golf provide a complete introduction to the fundamentals of the game, rules and etiquette. Professional instruction covers basic full swing fundamentals and short game techniques. Lots of games and prizes make learning the game fun! Each Junior Camp consists of two hours of instruction for three consecutive days. Camps are designed for youngsters 8 to 12 years old and are limited to six students per camp. Willow Creek provides golf lessons for youth ages 5 to 17. Junior Golf combines professional instruction, on-course play and plenty of camaraderie among players. Choose from two sessions, both covering the full swing, short game and putting. Chow’s, in West Des Moines, offers both competitive and recreational day camps and training camps. Their summer camp schedule will be available in March. During the summer Mid-Iowa Gymnastics offers some fun gymnastics camps for kids. Activities offered at camp typically include obstacle courses, bouncing on their trampolines, tumbling, races and games, arts & crafts, and more. This is a great chance for your child to meet new friends and improve their fitness. No previous gymnastics experience required. Ages 5+. The Des Moines Menace offer soccer camps in June and July for boys and girls ages three to 14. Menace Camp provides a fun mix of games and drills for players of all abilities and experience levels. Counselors are top-level soccer players, who share their love for the game. Each camper receives a Menace Camp t-shirt, and four tickets to catch the Menace in action at Valley Stadium. JUSC’s Summer Training Program are directed to the developmental age and abilities of the participant. Coaching staff will look to improve and develop participant’s ability through a variety of activities including: passing, receiving, dribbling, decision-making, awareness, and player movement with and without the ball. West Des Moines Soccer Club’s camps and clinics goal is to educate and supervise every player in a safe environment and build confidence while providing an enjoyable camp experience for all. Their coaching staff is comprised of former professional players and a number of college athletes from Des Moines area. The Des Moines Parks and Recreation department offers a variety of tennis lessons through the United States Tennis Association (USTA), tennis tournaments, and youth tennis leagues. They also offer FREE tennis lesson through the United States Tennis Association (USTA) National Junior Tennis League (NJTL) program for children ages 9 to 14. Grimes’ Run for Fun in the Sun program gets kids interested in the sport of running in a fun and positive way. Camp will begin with a team builder warm-up, then go through dynamic warm-ups, followed by running drills, stretching, instruction/pointers, and end with fun games. For Boys & Girls entering Grades K-5. Clinics are held year-round at the Ohana Volleyball Club’s facility in Grimes. Their clinics are designed to provide players instruction on various volleyball skills. Summer camps will sharpen your player’s volleyball skills and prepares them for their high school tryouts and season. High Altitude Wrestling Club trains hundreds of wrestlers each year at their different training locations across Iowa. They offer numerous camps throughout the year. Their summer camps are held at Wesley Woods Camp & Retreat Center in Indianola. Summer camps start June 28th and run through August 6th, 2019. Do your kids have a favorite summer sports camp they attend in Des Moines? Tell us about it in the comments.